Artoo had an exciting week: He went on his very first field trip ever! His kindergarten class went to the Pumpkin Maze at one of the local greenhouses in town. I got to tag along, which was pretty fun. Artoo was so excited to go on the school bus, and he was pretty pumped to introduce me to all his friends. i'm pretty happy i was able to go. Since we spent so much of the day doing boring things, and we had a little bit of time between doctors and errands and supper - we took advantage of the weather and made a stop at the park where the boys played. Artoo is getting braver on the play structures, but he still is very cautious. It's so easy for him to get knocked over by other kids, i'd be cautious too. Wait, who's driving this thing? This weekend we Canadians celebrated Thanksgiving - and so my weekend was filled with "SO MANY FEASTS" as Artoo would say. Chewie and his cousins tearing it up!! Saturday we spent the day with B-rad's family at their acreage. We had an absolutely gorgeous day. Boys and the cousins spent a good amount of time ripping around on the quads and the golf cart. And after dinner they were playing hide and seek in the dark. It made me pretty happy that my boys will have those cool memories. Cheers from The Diva and the diva's Mother in law! On Sunday, my side of the family celebrated Thanksgiving at our place. It was crazy windy and rainy all day - so definitely not as much playing outside - but they found ways to keep themselves occupied. a table full of cousins. I'm beyond thankful for my two beautiful boys. They make me smile and fill my heart with unmeasurable love - they make me laugh and drive me to new and crazy levels of frustration....every single day. I am so thankful for the gift of being their mother. Today my parents are celebrating their 39th wedding anniversary. I am so thankful for the loving example they've been for me, still acting as newly weds as my brother says. My parents have been immensely supportive as We figure out this whole parenting thing. I'm very lucky to have three handsome men in my life - my brothers - who still make me laugh uncontrollably. My zentangle family, who continues to inspire me and push me and help me to grow. And, lastly, my soul is made whole by you Brad. Thank you for all of it. Everything. All the things. Thank you. Yep. I'm pretty darn lucky. This week Sakura posted a video of Molly Hollibough demonstrating her tangle called Munchin. She's also demonstrating the products in the black zentangle tool set. I had seen the step outs for Munchin many times and i never really took to it, until i saw Molly demonstrate it, back when i was certified in 2010. I don't know why, but seeing it demonstrated really helped me 'get it'. it's funny how many tangles i thought i 'knew' but didn't like...until i saw them demonstrated. Then the light bulb came on, and now they're in my favourites. Today's challenge is to use Molly's tangle Munchin. If you want the added challenge of using white on black, feel free to do that as well. i am not a huge fan of the black tiles. I've been holding this in for years. But it's true. Now, don't get me wrong. I still use them, but - i just don't like the way they perform as compared to the white tiles. I miss the drag of the micron pen. and the black tiles are very porous and the gel pen sorta gets sucked into the paper leaving the white looking sort of washed out. Some tanglers out there LOVE the black tiles and they make such delicious art with them, and i am envious of them. 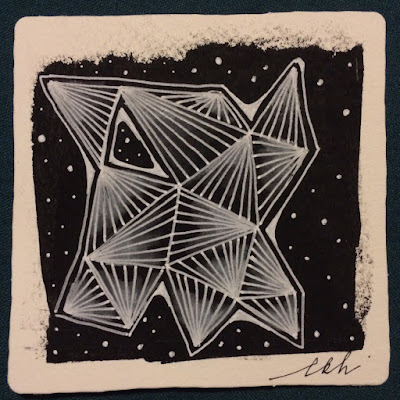 If you want to see a whole gallery of white on black gorgeousness, check out the latest post by Maria on the zentangle blog - go ahead! i'll wait!! I know you're supposed to gently kiss the gel pen onto the black paper, and i know that you can go back over the white pen to make it more vibrant. I know these things. and i teach these things. working on the black tiles does not make my heart sing. i've decided that it's very like when you are in a yoga class, and the instructor is showing you a pose, and everyone is doing the pose, but it's just not working for you. So the instructor says: "remember to listen to your body" - sometimes you need to listen to your body.... and sometimes it's okay to do a variation of the pose. so. i'm listening to my body. I love love LOVE the white zentangle tiles. i love everything about them. i love the weight. i love the drag. i love it all. they are my favourite. So, here i present to you: My white zentangle tile - with a bit of black gesso. I put a little dollop onto the tile and then spread it using an old plastic gift card, or hotel key. it dried, literally, in seconds. what i love about black gesso is: It is SO black. It's very black. what is gesso, some of you may ask? Gesso is essentially a surface primer. When you buy those pre-stretched canvasses from art supply stores like michaels? They are pre-gessoed. (this is why they're white, canvass is actually kind of tan coloured) i love gesso. i use it all the time in my art journals and in my paintings. I'm not going to get into all the ins and outs of gesso, if you're curious there's about a bazillion youtube videos on gesso. you can get gesso at pretty much any art supply store, i bought my black gesso at Michaels. 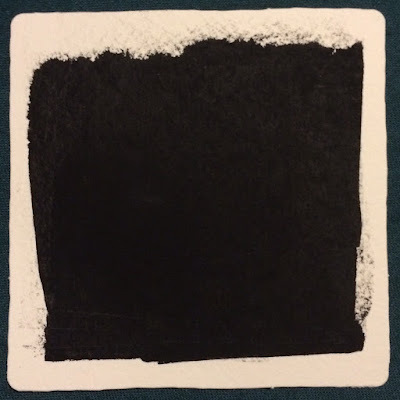 for my purposes today: i used black gesso on my tile because gesso gives your surface a little bit of tooth and acts as a bit of a barrier between your medium and your substrate (the thing you're painting, drawing, tangling on... in this case, my tile). Sakura gelly roll pens and black gesso are a match made in heaven. With the tooth of the gesso i got a bit of that pen drag back that i love with the microns and the white tiles. And because it's a bit of a barrier between the gel ink and the paper tile, the white is super vibrant and i don't need to kiss the tile with my pen, and i don't need to go back over it again. i have BLACK blacks and WHITE whites, and i love it. Again, this is what works For me. This is me listening to my body and doing a White on Black variation pose. have a great week everyone! enjoy playing with munchin! Wow diva, Thank you for the info on black gesso on the white tiles. I also will say that I am not a fan of the black tiles... I had one of those why didn't I think of that moments! Now to find that bottle that I have stashed somewhere from another project! Thanks for Molly's video. I thought I knew Munchin, but I definitely gained some insight watching her do it. I also sucked it up and used a black tile. Her pointers on that were also very helpful. I didn't like white pen on black paper too... I prefer Uniball Signo broad white pen over Sakura's gelly roll pen, cause the Uniball pen has more opaque ink. But currently, I much prefer using Uniball Signo's Silver. The ink lays onto the paper more smoothly, and the shine of the ink is just gorgeous on black Zentangle tiles. I love Munchin. Thank you for taking the time to create these challenges. You tile is absolutely lovely. Dear Diva. I am glad to hear your doubt about the black tiles. I thought I just didn´t know the way to use them. With pastel pencil they work allright, but that´s more like painting then doing zentangles I think. So I tried to find another black paper to work on and I think I have! A surface that makes the jellypen glide along! Tomorrow I´ll give it a match! I don´t have any black gesso but that looks amazing! Munchin is a friend of mine after I saw Molly Hollibaugh draw it... The video is so good! I loved this challenge. Unlike so many other tanglers who said that they didn't like doing white on black; I absolutely love doing so. I'll have to try using black gesso to see the difference. Thanks again for the weekly challenges. I really look forward to them every week. Why did I not know about colored gessos? Wow! More fun in the future. Thanks! Thanks Laura for this challenge that gave me so much fun and (again) the knowledge that I DO like working with white on black; something I hardly ever do. I also LOVE this tangle that I had 'forgotten'. I like your tile a lot and what a brilliant idea to use the black gesso. I enjoyed watching and listening to Holly. Doing so got me into the zone for creating my own tiles. I´ve finished Munchin on a black tile. But it is on some black thick paper I had used for other purposes. I have nothing against working with white on black. I love it! But I think I like it better to work on my found paper then the original tile. I will give the original tile another chance though. And stop thinking that there is something wrong with me! Maybe I´ll get surprised! Now I´ve made it on original black tile. It is my third try and I think it came out ok. But guess! I´ve ordered BLACK GESSO! I have to try that! I chickened out on the black tile, although I might have another go but it is a pattern I like, so that might be fun. Sounds like I'm not the only one who does not love white on black. 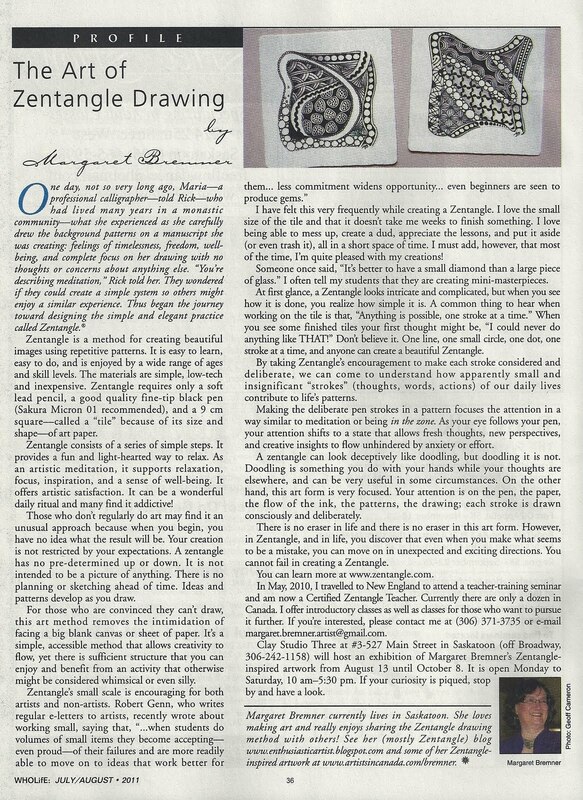 But I must say, the Zentangle blog, Molly's video and the Diva's challenge have all served to spark my interest. Had fun - Thanks Laura. I love your black gesso tile, Laura! I agree with you about the black ZT tiles. I have found the Strathmore black artist tiles have a better feel for me. Thanks for the video, too. Molly's lessons are always so relaxing. Dear Laura, thank you very much for another great challenge. I also love the reports of your family life and this week I am absolutely enthralled by the pictures of Artoo on his field trip. He is SO cute! I'm getting ready to do a class with the black tiles. It's nice to have an honest opinion about working with them. If I run into a similar issue I'm going to try your fix! Thanks for another great challenge!! The black gesso tip, GENIUS ! I like white on black, just not ghosty white now that problem is solved. Laura, Thank you ever so much for all of your great info with using gesso. I bet Youtube was just swamped with searches for use of gesso! Thanks again, and for your confession:0) Don't worry, the policce aren't gonna come after you! :0) I don't mind the black tiles so much, I just forget to use them and the renaissance ones.